Updated: 6/19/18 Summer is in full swing filled with picnics in the park and poolside barbecues, but in the midst of all the fun with friends and family, it’s important to understand the risks of food born illnesses. Pack Up Properly: Consider the foods being transported and what the proper means of storing them should be. For grilling, be sure to separate raw meats and other uncooked items in tightly sealed containers away from cooked dishes and produce in the cooler. The risk of mistakenly consuming raw meat can result in E. coli poisoning, Salmonellosis and other harmful bacterial contaminators. Be Allergy Aware: Be conscious of diet restrictions (vegetarian, vegan, etc.) and allergies (nuts, shellfish, gluten or lactose intolerance, etc.) and to ensure certain foods are kept away from one another for packing and mealtime. In some cases, a printed recipe card with ingredients for each dish can be helpful for guests or discussing the menu in advance. Prepare for Germs: Make room in the car for paper towel, hand sanitizer or disposable towelettes to keep your space clean before, during and after mealtime. Prior to unpacking, be sure to wash hands and wipe surfaces thoroughly, especially when at playgrounds or swimming pools. Clean grills, especially those uncovered, to avoid the threat of animal waste and viruses or bacteria. 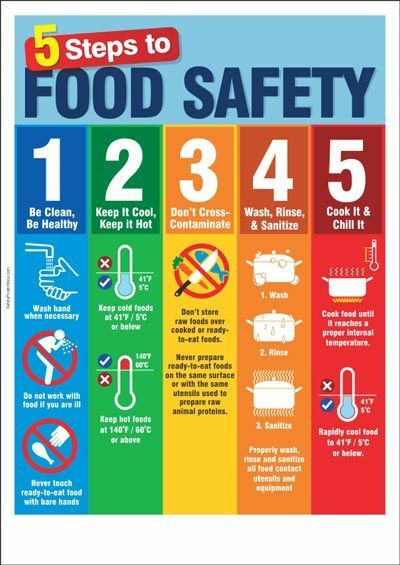 Avoid the Temperature Danger Zone: One of the most important safety measures to keep in mind when handling food is to stay away from the temperature danger zone, which ranges from 41 to 140 degrees F. It pertains to cooking, storing leftovers and reheating foods. The U.S. Department of Agriculture and Food Safety and Inspection Service reports that bacteria grows rapidly outside of this zone, doubling in as little as 20 minutes. Purchasing a food thermometer at a nearby dollar store is a useful tactic in managing the risk on picnic/barbecue days. Hot Foods: Cooked items, whether they are brought to the party or prepared onsite, should always stay at or above 140 degrees. This can be done by using hot packs, chaffing dishes and slow cookers. You can even create a hot box in a cooler with warmed bricks wrapped in towels. Foods can also be kept on the grill at a low temperature to stay warm. Cold Foods: Placing gallon bags of ice or towel-wrapped dry ice beneath food containers can keep veggies, fruits and other cold items at or below 41 degrees. If space in the cooler is limited, freeze water bottles, yogurt tubes and/or juice boxes to use as a means of keeping food items cold. This way, the family can also stay hydrated with the items as they thaw. Dodge Dehydration: With children and busy families, it can be helpful to set timers throughout the day to remind everyone to drink water and take a break from summer fun to get hydrated. Believe it or not, water is not the only way to do so. These foods can easily be integrated into a summer menu and contain a high percentage of water to keep the body hydrated: Celery, Cucumbers, Grapefruit, Peppers, Oranges, Strawberries, Tomatoes and Watermelon.